You might feel different from everyone else, your identity swept away with every twist and turn of the journey. But it is possible to redefine yourself after trauma. When life feels like it’s been turned upside down, Surviving Me will help you find your way through. With exercises to help you focus one day at a time, audio recordings to help you relax and a daily planner to get you through difficult times, it is possible to take back control. You can reconnect the threads of your life and tell your story in your own words. Read how others found their way through the fog to reach strength, acceptance and understanding. Listen to how you can start living the story you want as your legacy today. Learn effective relaxation techniques to help manage your emotions and stay calm in times of stress. Surviving Me is just the most amazing support for someone in the situation I have found myself in since being diagnosed with breast cancer. Thank you, Helen, for all your support and for the wonderful techniques and coping strategies you have taught me along the way. Without them, and the CDs, which I have used constantly, I wouldn’t have been able to relax and sleep, and cope with everything I had to face. It has made everything so much easier and allowed me to focus on living each day. I find Helen’s ‘Sleep relaxation’ CD so relaxing. It helps me to rest and go to sleep. Also, it enables me to get back to sleep when I wake during the night. The voice is so soothing and calming and makes me feel so comfortable. I started using Helen’s CDs when I was living in Mauritius two years ago. I was struggling with stress and anxiety as my condition was progressing. I was undiagnosed at the time but the fear hanging over me was that of Motor Neurone Disease. I was terrified and unable to function. The CDs helped me so much – when I was trying to relax and sleep, and when I had to undergo intense and frightening nerve conduction tests when I was at my lowest. I loved the visualization CD particularly and the sleep CD was amazing. I love Helen’s voice – it is so calming and soothing. After my late wife, Rachel, was diagnosed with secondary breast cancer in 2012, not only did she have to deal with grieving for the life she once knew, she also faced the daily challenge of how to accept and cope with her new life. Surviving Me was inspired by Rachel’s journey (and many others) and is testament to Helen’s natural ability to care for others and a generous gift to those living with a life-changing diagnosis. 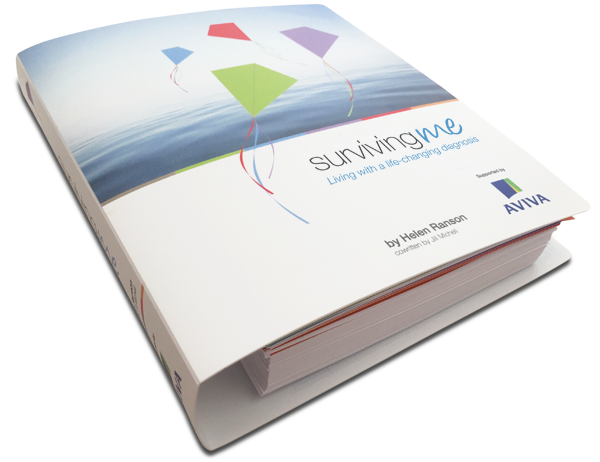 Everyone who has seen Surviving Me has been bowled over by its content. It is the most incredible, thoughtful and edifying resource for anyone who is struggling with a life-limiting illness. Learn how to think positively, one day at a time. Stay in control mentally and emotionally. Develop coping strategies to beat stress and anxiety. Make time for reflection and meditation. Find acceptance by telling your story.